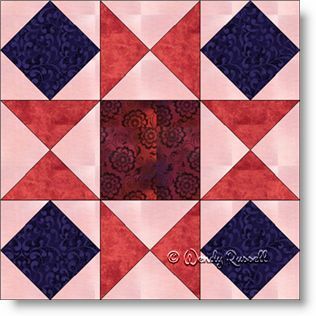 The Ornate Star quilt block might look familiar to you as it is similar to Ohio Star and other star blocks that contain quarter square triangles as part of their focus. But -- the Ornate Star block takes things a little further -- by adding features in the four corners of this nine patch block -- the square in a square patch. In my view, this is a much underused patch and is really fun to make. Bonus -- it adds some extra interest to your block. The illustrated quilts feature both samples using an on point setting, but look very different. The sashing strips on one quilt add a little pizzazz while the other quilt gives you ample room in the blank blocks to showcase your quilting skills.